For some reason money seems to be a big issue for many massage therapists. Many come to the profession because they want to “help’ others. Helping others seems to become equated with you can’t make money for helping people. It is common to hear ” I am not in this for the money” or “I didn’t become a massage therapist for the money” or the other common one ” I just want everyone to be able to afford massage”. Money Fog is all of your old false beliefs about money that keep you stuck from making and having the money you need. Massage Therapists taking low paying jobs and resenting and complaining about how they are treated and what they make. MT’s think it is better to NOT have money, thinking that money will cheapen what they do and the caring that is involved in this work. MT’s thing that massage is such a loving and caring service that people should not have to pay for being cared for. MT’s giving away their time doing free or low cost massages in an effort to get new clients or to help others when they are not in a secure enough position to help others. MT’s who keep lowering their rates, trying to undercut other businesses out there and take business away from others because that is what they think they have to do to get new clients. MT’s who don’t have a cancellation fee and some who have one but don’t enforce it. Letting others walk all over you is not good for business. When you don’t value your time, clients won’t either. MT’s who work on less than their ideal client and then feel resentful and drained from doing so. MT’s keep their rates low thinking that they want to be available for everyone. Think money is somehow bad and that they shouldn’t have any. When you think of money, you think of greed – not love. You think that having money means you are greedy. These are just a few of the things I have seen in Massage therapists and of course in myself. I started out in my career choosing massage because of the art of being a massage therapist and the lifestyle it would allow me to live. I also didn’t have or need much money when I first started out and didn’t care much about the future. I just thought it would all work itself out. After all I was just “Doing what I loved so the money should be following” – Right! Just be positive and have positive thoughts and you will have enough money. Yeah Right! Well forget that stuff! All the books on that are just a waste of money. Thinking won’t bring you much. Action will and being more conscious of your spending habits and also being aware of your needs instead of focusing on wants. What will bring you more money is being money conscious and having a spending plan – not a budget. Create a spending plan. Track your income and expenses down to the last dollar every month. Know where your money is coming in from and going out to. If you have extra expenses then you know you will need to make more money that month. Figure out a plan on how you are going to do that. Tracking money like this has helped me get out of the money fog. The money fog is the place where you deny you have money problems, deny you are in debt or just sit around worrying about it and doing nothing about it. It is the place where you are in denial about money. You don’t know how much you have, how much you make or how much you need. When you don’t know how much – exactly – that you need it keeps you just spinning your wheels saying “I need more money” or “I don’t have enough money”. How much is enough? How much do you need? When you know exactly what you need, you can create a plan to get it. When you see you are not fulfilling that plan, you can make adjustments in other areas or you will get motivated to do the things you need to do. Tracking money in this way has also helped me to see that money and having money is just a math problem. Taking all of the emotions out of money will allow you to see money in a different way. You need money to stay in business, pay the bills, save for retirement, take vacations and the more money you have- the more you can help others. You can help set up low cost clinics or teach groups of women how to do massage so they can build better communities. You can give more when your basic needs for money are fulfilled. Just like the old airplane warning – put your air mask on before helping others. Save for taxes. Create a separate account for your tax money. Set aside a calculated amount each week and don’t touch it so you have the money to pay the tax man each year. You charge for your time – not for caring. The caring is FREE! Your time is valuable. It is time spent away from your family and friends. It is time away from your life. Yes massage isn’t so bad as some jobs/careers and can seem like it isn’t work, but your time is still valuable. Charge what you need to make to stay in business. Charge what you need to make so you don’t feel resentful. Do what you need to do to get to that level. Learn more about setting your fees. Charge for no shows or last minute cancellations. This is one of my pet peeves in the massage world. When people don’t show up or cancel at the last minute and you don’t charge for your time – what are you saying about your time? If you say something like It’s OK because I can use the time to do something else then something is wrong in your schedule or you need a vacation. People who don’t pay for missed sessions, don’t respect your time. I guarantee you that you will end up feeling resentful and burned out. Learn more about setting cancellation policies and enforcing them. If you build it they will come. This attitude seems to be prevalent with massage professionals. Many therapists just think that clients will magically appear if they open their office. They will come but you have to tell people about your services. You have to get people in the door and on the table. You have to be doing something every day to market or promote yourself. I just want to do massage. Yes most massage therapists do. What are you willing to do to make that happen? What are you willing to do to get clients in the door? I don’t have a website – its too expensive. Investing in your business is the best thing you can do for yourself and your business. Investing in things like a website that will get you the clients you need is telling you that you are worth it. It is telling yourself you are serious about what you are doing. You can’t afford not to have a website. You are missing out on all of the people who are searching for “Massage, your city”. These people are already looking for massage. It doesn’t get much easier than that and is worth investing in. Learn more about creating a successful website for your massage business. Raising your rates every year or every other year is just a part of doing business. I have heard some massage therapists proudly say that they have never raised their rates in 10 years. They are still charging like $40 an hour and doing it proudly but they also don’t have anything to show for all the years of working so hard. It is just part of doing business. People expect you to raise your rates. I have had the richest clients complain about me raising my rates. I have had people tell me it was about time back in the early years when I didn’t raise my rates often. I once had a client tell me that I don’t ever have to explain why I am raising my rates. It is just business. When I finally got that, I now raise my rates every two years at the first of the year. ( I now charge $85 an hour.) Yes you might lose clients when you raise your rates. You will also get new clients who will gladly pay your higher rates. You don’t have to feel guilty about raising your rates. Learn more about raising your rates. MT seem to be always giving their time away at free events – health fairs, sports events, conferences, charity events. Putting your needs first before taking care of others is again the motto from the airlines. Could you be using this time somewhere to be working on people who are paying you? Can you afford to give your time away? Trading for massage and other services is another issue quite common. I am not saying bartering isn’t good but when you barter too much it will be hurting your business. You might think you are saving money -but are you really? When I stopped trading massage with my friends and started paying for a regular weekly or every other week massage, I finally felt like I could relax for my massage. I got much more out of it. I would even go into places to get massage and not tell them that I was a massage therapist so I wouldn’t have to think or talk about being a massage therapist. I got much more out of the massage than when I was trading. Marketing and promoting your business is a full time job in itself – well at least a part time job. If you don’t have any clients, you need to be spending most of your day doing things to get clients until you get the clients you need. Marketing is just telling people what you do. It is not about sales. It is about building trust with potential clients and getting the word out there about what you do. Having a clear marketing plan and being able to implement it is necessary for success. See my big list of massage marketing ideas. Having money is OK and even GOOD for you. Why does having money always have to be equated with being evil or thought of as bad? Money is just money. It is just a large math problem. The idea that not having money is better is the way of Noble Poverty as Mikelann Valterra author of “Why Women Earn Less” calls it or being a Money Monk. Living a simple life is one thing but living in poverty is another. It is OK to have the money that you need. It is OK to take nice vacations to HI, Costa Rica or other wonderful places. It is OK to have a retirement account. Some how many massage therapists have the idea that it is better to not have money. It makes them somehow look better or more virtuous. Having money is somehow being corrupt or wrong. That just isn’t true.Noble Poverty is the continual practice of earning less then one needs based on the belief that there is virtue in not having money. Charging people who need help can seem cold and heartless. The messages about money come from how you were brought up. The things you learn along the way become your way of life without questioning if it is correct or not. When you start looking at your deeper beliefs about money and what you think about money, you will become more aware of why you don’t have the money that you need. It is a process of looking at the deeper aspects of yourself. Working with a counselor and a money coach can help you to get a handle on your beliefs and start changing them and climb out of the money fog. Work through your Money Autobiography. Are you waiting to be rescued? Do you think that if you do what you love the money will follow? Are you just thinking about money and waiting for the law of attraction to kick in? This is one of the things I call the Code of the Caretaker. MT and other caretakers think that if they just do enough good, that money will come their way. Thinking this way is really continuing the self fulfilling prophecy that you are not worthy of having money. Thinking that way is just another way of beating yourself up. It is also about if I do enough good things, that I will be loved and cared for. It is many people’s secret wish to be taken care of. MT seem to have it too. It is one of the things that come up when being a helper. Helping professionals often fall into these traps of thinking that helping will get them the love and recognition that they need. It usually ends up burning them out. Yes there is quite a bit of deception in the massage profession about just how much you can make as a MT. Massage schools are advertising massage as the up and coming career with the demand for massage therapists growing every day. Yes it is growing. Entry level jobs start at $12 an hour. Wahooo! You can make the same as a cashier at a grocery store. The lure of careers in massage make it all sound and appear like such a relaxing, nurturing, high paying career. They forget to tell you that you will be working harder than ever especially if you start your own business. Underearning or not making enough or having enough money serves you in someway. Getting to the real reasons about why is a process of becoming more aware of the ways that you think about money and the ways that you handle money. What are you getting out of not having any money? Uncover the deeper issues under the underearning and it will help you climb out of the money fog. Do you think you have to sacrifice and give up yourself for money? Do you let money or the lack of money continue to beat yourself up? Does that little voice in your head constantly make you feel depressed about not having any money? Do you not have money because you fear it will be taken away? Do you fear you won’t be able to handle the money? What are you getting out of not having the money that you need? It can be a very painful process to look at these deep underlying issues around money but can be well worth it. 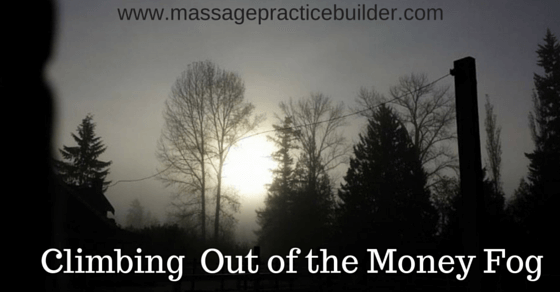 We can begin by talking about money more honestly with other massage therapists. Helping – Oh boy! This is the reason why many people get into careers in massage. It is also the thing that will end many careers in massage. Helping professionals are faced with the issue of helping others or making money. You can do both, but many think that they can’t. I created a long list of questions to ask yourself about why you like to help and what purpose it serves. I use it when I work with massage therapists in building their business. Coming to terms with helping and understanding the need to help can help people go beyond helping to a career in serving and Making money to boot! The other part of helping is about the need to rescue others which often is associated with giving up one’s self and money to help others thinking that it will get them love. Along with helping is the need to fix which is also about being a caretaker as compared to a caregiver. When you are a caretaker – you are taking care of others at the expense of yourself. When you are giving care you are taking care of yourself first and being more present with others on their healing path rather than feeling like you need to fix them. See also: The Code of the Caretaker. I agree with Bill, Thank you for posting this article, it has definitely been an eye opener, especially with setting fees, a cancellation policy, and setting a budget. Thank You Julie!! Set up a self employment tax saving account and like you said budget a regular transfer to that account. My tax program estimates my quarterly payment and sets up an automatic withdrawal from that account. Come April 15 I am not torn between paying my taxes and renewing my licence which comes due at that time. Great article Julie. I wish I had that advice back when I started as a therapist.